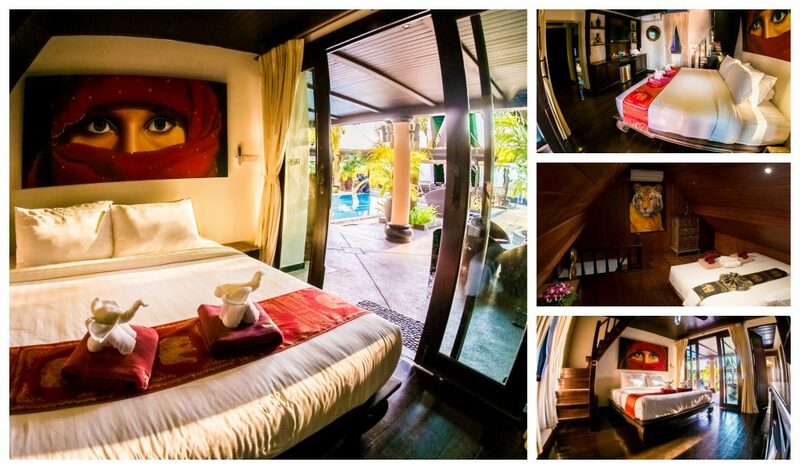 Bann Chang Thai Villa has 9 bedrooms (8 en suite) and 3 extra sleeping areas for a grand total of 12 separate sleeping quarters. The villa is divided into two levels: upper and lower. 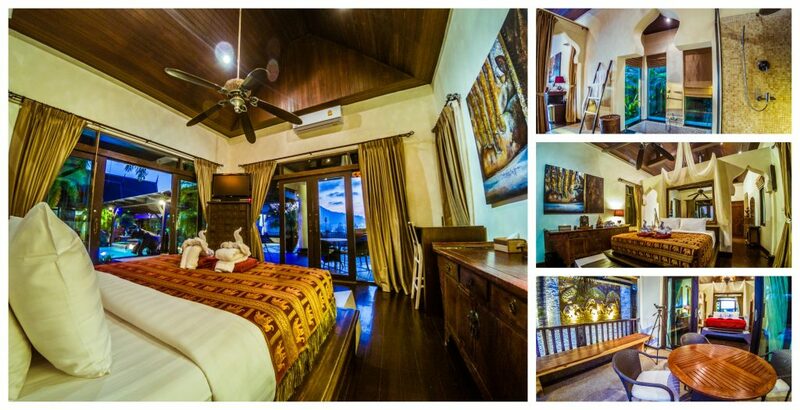 In total, this villa has a sleeping capacity of approximately 30 guests. The upper level has 5 bedrooms: 1 master bedroom with a large, walk-in bathroom (shower & bathtub) and an alfresco seating area outside; 1 king room — en suite with shower and large bathtub — which has a small loft above it with a queen bed; 1 large, two-story, room with 4 twin beds (2 on each floor), a mini loft, and a separate shower; 1 queen room with en suite bathroom; 1 king room — en suite — with a loft area above that houses another king bed and a twin single bed. The lower level has 4 bedrooms: all 4 rooms have full, en suite bathrooms (with bathtubs); 3 of the rooms have king beds and 1 room has 2 twin singles. All our rooms come with premium beddings, quality furniture/appliances, standard toiletries, and stylish works of art to ensure the most comfortable stay. Furthermore, we hold ourselves to the highest standards of cleanliness by providing our guest with several maids that are tasked with the daily cleaning and maintenance of each room. 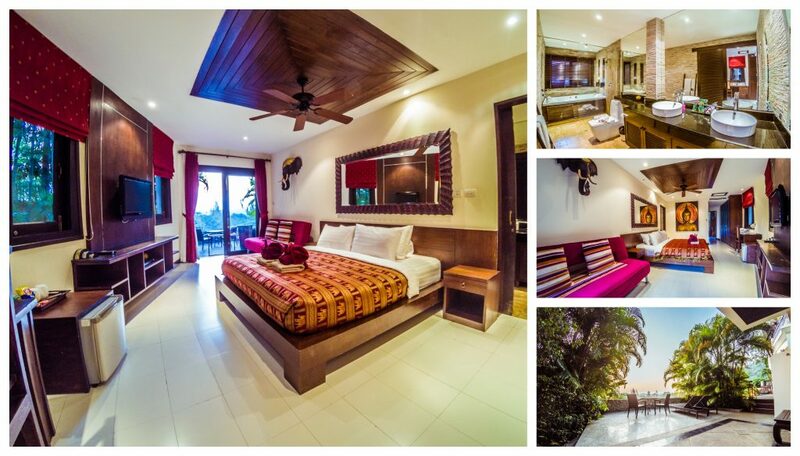 Both our villas are situated in quiet locations away from the noise pollution of traffic and late night bars. So rest assured, a good night's sleep awaits you — every night. Please scroll down for more detailed information about each room. 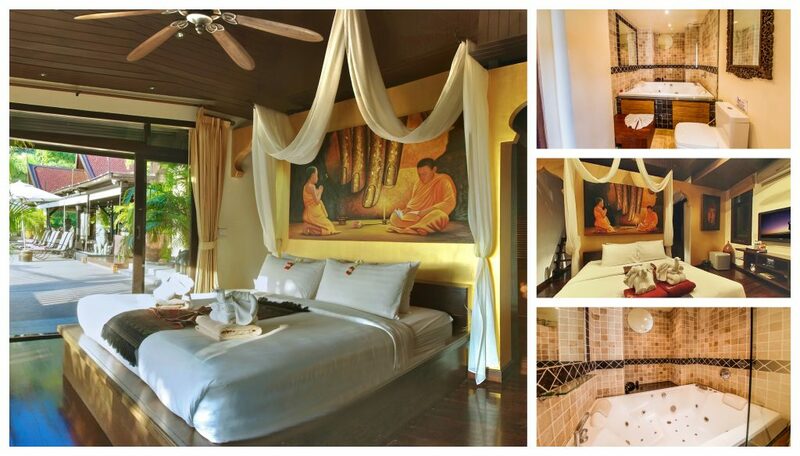 "The rooms of the villa are spacious, luxurious and beautifully decorated. 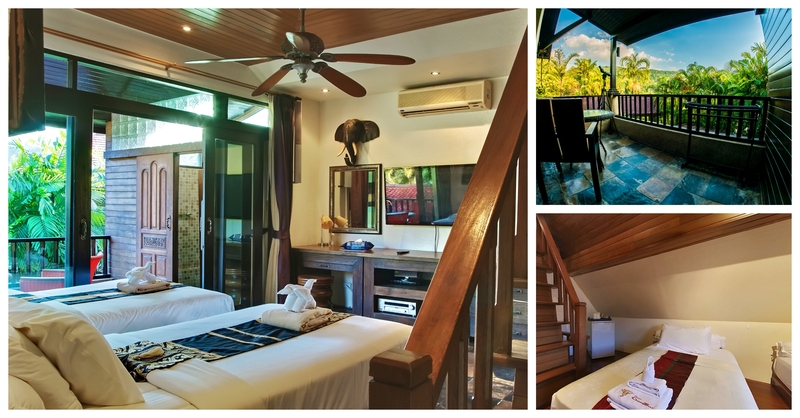 In every way the villa has a personal feel that makes it feel like home rather than an impersonal resort." 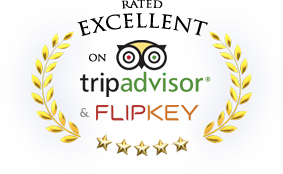 "The level of daily cleaning here is equal to or better than any hotel I've ever stayed in, including the one and only Four Seasons and the original Peninsula." This is the master king bedroom. This exquisite room has a large, "walk-in" bathroom with shower and bathtub; the mosaic bathtub is encased with windows that are surrounded with the greenery of tropical plants — a soothing experience. This room is a favorite amongst brides as the large, luxury bathroom is the perfect hide-out to get their hair and make-up done on that special day. This room also comes with an alfresco seating area just outside the door where you can sit and enjoy the colorful sunsets; and it's just a few steps to the pool. This cozy room with it's wooden staircase and loft area is perfect for families. The room has two levels; on the first floor you'll find a king bed with en suite bathroom; on the second floor — loft — there's another king bed in one section of the retreat and a twin single in the smaller, adjacent section. The loft, with the wooden v-shaped ceiling, has a true "wilderness cottage" feel to it and is suitable for guests both young and old. The door to the room opens up under the verandah and is located next to the large living room and is just a hop, skip and jump into the pool. This smaller queen room — with en suite bathroom — is just a stone's throw to the pool and is perfect for young couples, singles, or kids. 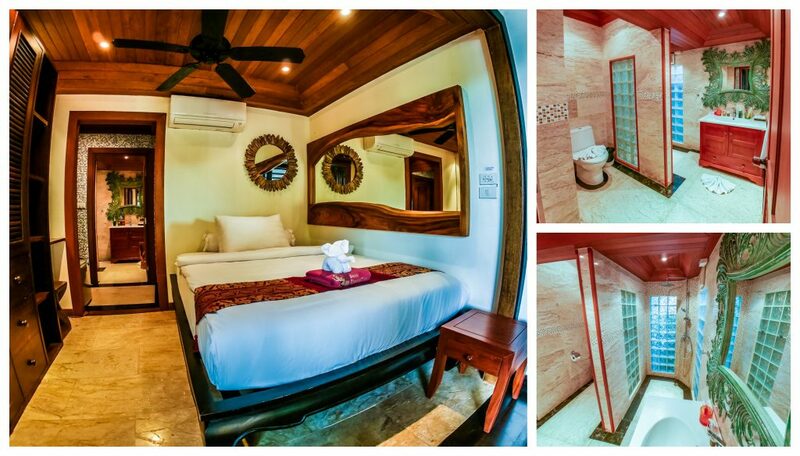 It has a spacious bathroom with rain shower; and it's door opens up under the verandah. While smaller than the other rooms, the beautifully framed mirrors that decorate this room give it a very comfortable feel. Furthermore, the cool marble floor is a welcoming relief to the soles of your feet after playing in the hot sand of your favorite beach. The fifth and final room on the upper level has two floors. The first floor has two twin singles, a lovely balcony, and an outdoor shower room with sink. The second floor — or retreat — is connected by a wooden staircase and houses to more twin singles. This room is perfect for kids or single adults. The private balcony is ideal for those who which to socialize outdoors, but away from the group, and offers refreshing views of the surrounding hills. There is a bathroom (toilet) just outside the door, along with an alfresco seating area. Room 0 — also known as "Lilly" — is the most secluded room in the villa and offers the maximum amount of privacy for those who need a little more personal space. The room is tucked away behind the alfresco seating area, where the billiards table is located, and comes with its own spacious terrace where you can lounge in the sun or enjoy a cold sundowner or nightcap in style. This king room comes with a big, full en suite bathroom that has cool marble floors, two sinks, large mirrors, and a jacuzzi bathtub. The room also has a work desk where you can set your laptop, sit down and catch up on business emails. With several windows and a large glass sliding door, the room gets plenty of natural light — including the bathroom. Perfect for kids or adult singles, Room 1, consists of two twin singles and is located just outside the beautiful infinity pool. 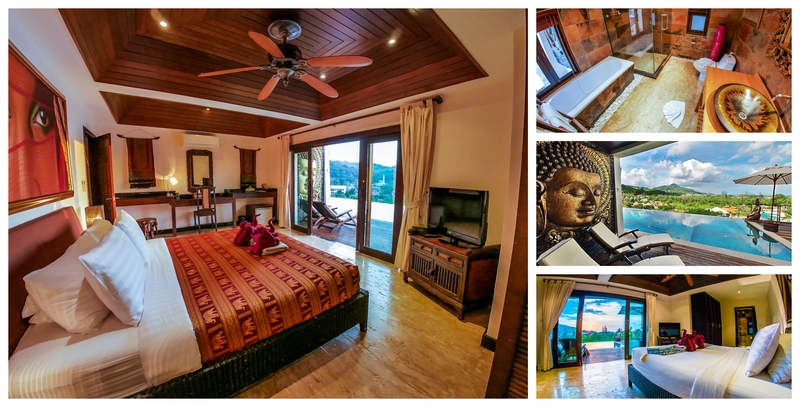 It offers stunning sunset views, and overlooks Kamala valley and the surrounding hills. The gym is located right next to this room and can be accessed from either the pool deck or the inner hallway just outside the door. This room — like all the other rooms on this floor — comes with a uniquely decorated, full en suite bathroom. With the bedroom floor on the same level as the infinity pool, which drops off a cliff, this room exudes an exotic vibe that all ages can enjoy. 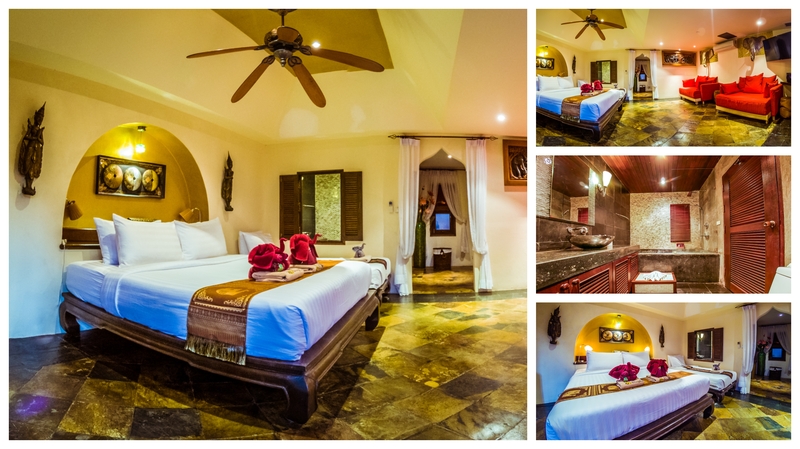 This romantic, king room, with full en suite bathroom is ideal for couples who enjoy a midnight swim as it is also located just outside the infinity pool. Located on the other side of the gym, this room also provides delightful views of Kamala valley and the lush hills that surround it — not to mention stunning sunsets over the Andaman sea. With a separating wall — which is decorated with an impressive bronze Buddha — between you and Room 1, you still get a sense of privacy when lounging in the sun chairs outside on the deck. This large and charming king room with full en suite bathroom comes with an extra twin single and two sofa beds which makes it perfect for families. While it doesn't get as much natural light as some of the other rooms, Room 3 still has a lot to offer. Firstly, the absence of direct sunlight and the lovely tiled floor keeps this room extra cool — perfect for chilling out after a day in the sun. Secondly, the yellow tones give it a bright and positive vibe. Thirdly, its two large sofa beds are ideal for unwinding with a mobile device after a long day of outdoor activity. 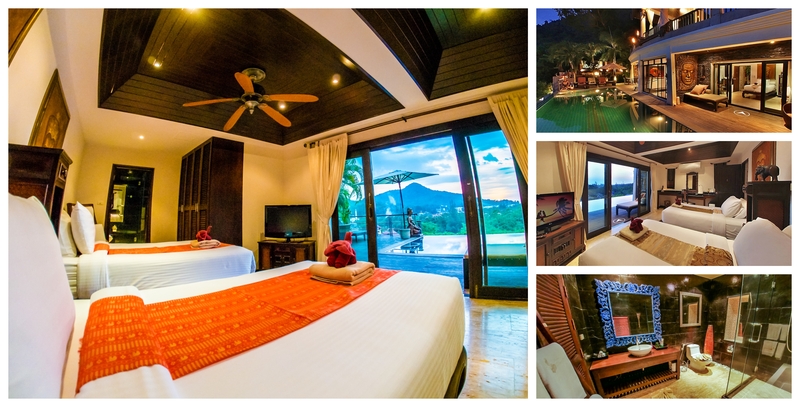 Along with the inner door, the room has another door that gives you access to a private pathway to the infinity pool.